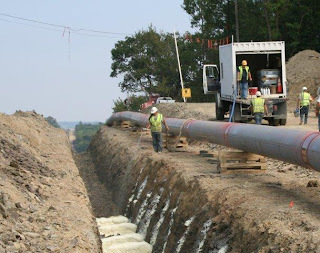 There are about twenty interstate natural gas pipeline systems crisscrossing the region from West Virginia to Maine – and that number is growing as gas drilling operations expand. New wells need lines to get their gas to existing pipelines, and as more gas is produced even more pipelines will be needed to transport gas to market. But pipelines do more that transport existing gas to market; they create potential drill zones. Ask any NY landowner coalition and they’ll tell you that the first Marcellus wells will be drilled close to the Millennium pipeline. These pipelines are a key to future development, says Tom Wilber. The other thing with pipelines is that no matter where you put them, people will eventually end up living near them. And that, says Meghan Thoreau, is a problem. Thoreau, a planner with Southern Tier Central Regional Planning and Development Board, says that most pipelines were originally constructed in rural areas. But towns and suburbs expanded, encroaching on the pipelines. Poor planning resulted in pipelines running beneath back yards – places where, over time, people (and planners) forget about them. As the area develops roads expand and communities may erect sound barriers that cut off access to those pipelines. Residents may build fences, place pools or plant trees that interfere with access to a pipeline. All of that building cuts off access to the pipelines – access critical to maintain and repair the lines. And that is a disaster waiting to happen. Thoreau suggests that municipal planners take advantage of tools including the National Pipeline Mapping System and the Pipeline Integrity Management Mapping Application. You can see her entire presentation here. 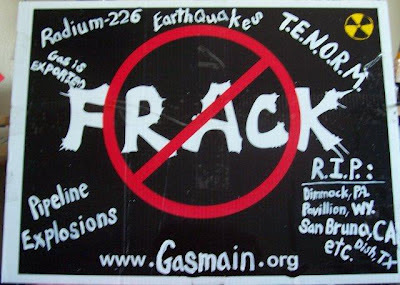 Bored with the generic "no frack" sign? Get creative! That's what one guy did - he added some missing details using cheap acrylic paints, a # 18 nylon brush, and a bit of research. Shale gas is big, it’s booming and it’s global. But if it's going to be permanent, it needs to improve. That's the message from investors and from John Deutch. Over the past forty years shale gas (and oil) is the biggest change our country has seen in energy, says John Deutch. The MIT professor, who served a number of years in the Department of Energy, recently chaired President Obama’s Shale Gas Production Subcommittee of the Secretary of Energy Advisory Board, so he knows a little bit about energy. He also sits on the board of directors of Cheniere Energy, Inc. and Raytheon and used to serve on the board at Schlumberger. 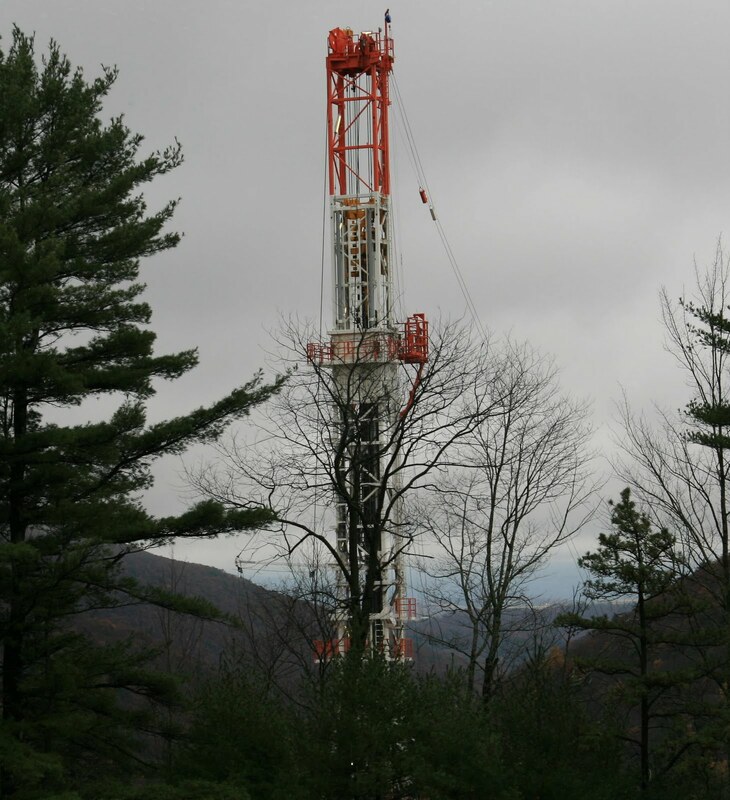 A couple weeks ago Deutch spoke at Cornell University about unconventional drilling. Shale gas – and oil – is a game-changer, he said. Not only are the reserves “huge and unexpected” but they are found around the world. And that has political implications for countries that are currently importing oil. However, he said, for these benefits to come to fruition the gas industry must take quick and decisive action to protect the environment. Developing shale gas is a heavily industrial activity that Deutch characterized as “extremely intrusive”. And, he reminded people, “…no matter how much gas we eventually use, reliance on natural gas does not avoid the threat of global warming.” Burning gas may decrease the amount of carbon dioxide we pump into the atmosphere, he said, but the continued leakage of methane from production and transport of gas adds an even more potent greenhouse gas into the atmosphere. But the biggest danger, by far, is the industry’s failure to deal with the environmental impacts, Deutch said. He pointed to four concerns that the President’s shale gas advisory board highlighted in their report: protecting air quality; protecting water quality; reducing impacts on communities; and long-term land use. Now, six months later, institutional investors are hammering the industry to get moving – to incorporate “best practices”. Why? Because uncertainty about the impacts of unconventional drilling on the environment and human health makes it harder to sell gas development to potential clients. They, too, have a list, but much shorter. But it also relies on measurement, disclosure and improving drilling practices. The President's shale gas subcommittee has spoken. The regulators have spoken. The people have spoken. Now the market-place has spoken. The question is: is anybody listening? 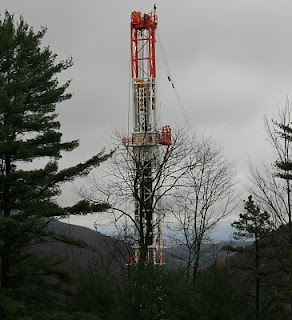 A couple weeks ago AP reporter Kevin Begos reported that the Pennsylvania Department of Health had received fewer than 30 health complaints on drilling. This information resulted from a FOIL request, but in light of the fact that the DOH noted “several dozen” complaints in the first half of 2011, it makes little sense. Except maybe to point out that the system intended to protect public health is broken. Upon closer investigation, AP has learned that the Dept. of Health isn’t following through on all drilling-related health complaints they’ve received. Furthermore, many people may not even be reporting health complaints because the DOH website doesn’t have a specific place for people to file such complaints. And, the agency has no current investigations regarding people who claim gas drilling has impacted their health. The fact is this: drilling and production of gas is not healthy for children and other living things. People living in the Marcellus drilling fields are suffering ill health, and it’s not just the drilling; compressor stations and storage fields are contributing to health problems too. It’s not just groundwater and fracking – it’s the whole enchilada. People are suffering from rashes, headaches, fatigue, dizziness, nausea, nosebleeds, sore throats, sinus congestion, blisters, skin lesions, respiratory distress, and hearing difficulties. They are suffering from vomiting, diarrhea, pain, elevated heart rate, hair loss, headaches, eye irritation, intestinal cancer, ruptured spleens, stomach cramps, loss of balance, slurred speech, memory loss, and tremors. One 32-year old woman, living in a home 200 feet from a gas well, became comatose for three weeks. Her liver failed, her lungs filled with fluid. Her heart valves had been encrusted by an unknown foreign body. When tested, her blood had 11 times the “maximum allowable” amount of barium, and that was two years after she had moved from the drill site. Recently her 12-year old daughter has been having balance problems, falling down while walking. So, how many people are we talking about? In media reports alone, we’re looking at close to 90 Pennsylvania residents who have complained about health impacts related to drilling. There are more, for sure; people who can’t – or won’t – report illnesses because they may not see a link to industrial activities in their neighborhood. While asthma is related to pollution, the last asthma study PA completed was in 2009, for data collected before drilling really started. Then there are things like heart attacks, also influenced by air pollution. 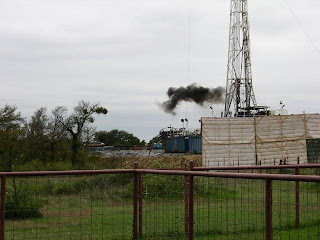 A survey done in one Barnett Shale community revealed anecdotal evidence linking an increase in the rate of heart attacks with exposure to drilling emissions. The lack of health complaints in PA does not mean that people aren’t suffering health impacts. It means that no one is collecting this vital public health data. Farmers from Colorado to Louisiana to Pennsylvania have seen their livestock sickened or killed from exposure to drilling fluids, muds and additives. Emissions from well sites, processing facilities and flaring also contribute to health impacts. Animals that don’t die outright may lose weight, show decreased fertility, or experience an increased number of stillbirths, abortions, and birth defects. Industrialized gas drilling has turned rural communities into “de facto laboratories for the study of environmental toxicology,” say veterinarian/researchers Michelle Bamberger and Robert Oswald. Farmers – and their animals – are not just exposed to drilling substances; they’re also exposed to the naturally occurring metals, volatile organics and radioactive compounds that are brought back to the surface during the drilling process. Last year the team documented 24 cases of animal and human health problems with potential links to gas drilling. They visited farms, interviewed farmers and veterinarians, obtained water, soil and air testing results and results from human and animal lab tests. Only two cases of the cases resulted from direct exposure to hydraulic fracturing fluid; most of the exposures were due to consumption of contaminated water from wells, springs, ponds or creeks. While some cases were due to accidents or negligence, for the most part exposures were a consequence of “normal” drilling operations. The most common symptoms Bamberger and Oswald found were associated with reproduction: cows had trouble breeding and experienced a higher incidence of stillbirths. Of the seven cattle farms studied closely, 50 percent of the herd, on average, either died or failed to breed. They lucked out when two beef farms provided natural “controls” – an opportunity to compare exposed cattle with their cohorts who were not exposed. In one case 140 cattle were exposed to wastewater that leaked from an impoundment; 70 died and the survivors suffered a high incidence of stillborn and stunted calves. The remainder of the herd – 60 head pastured with no access to the wastewater – experienced no health problems. In addition to livestock, Bamberger and Oswald documented health impacts for farm dogs, cats, horses, poultry and llamas. In some cases, dogs and cats drank from puddles left when drilling waste fluid was sprayed to reduce dust on roads. Those companion animals experienced reproductive problems. They also suffered from seizures and other neurological problems, gastrointestinal symptoms, and developed skin rashes or lost feathers and hair. It’s not just the animals that pay the price. 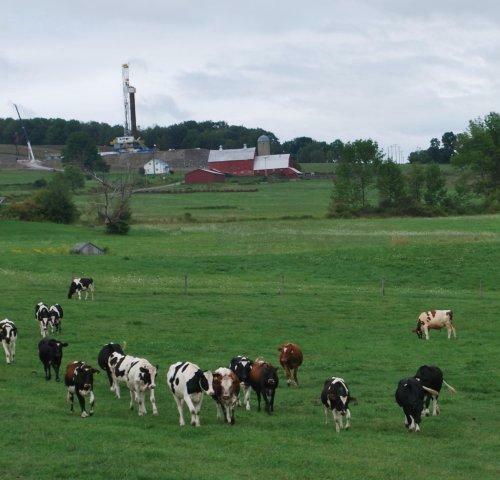 Carol and Don Johnson, who raise beef cattle on their Tioga County (PA) farm, have a well drilled on their property. Two years ago, flowback fluid leaked from an impoundment pit leaked onto a pasture where the Johnson grazed their cattle. In response, the PA Department of Agriculture quarantined 28 head, including 16 cows, four heifers and eight calves. Adult animals were held from the food chain for 6 months and calves exposed in utero were held from the food chain for 8 months. But the exposed calves were quarantined for two years – a real loss of income for the Johnsons. Then, last spring they suffered additional losses: eight of 11 calves born to previously quarantined cows died at birth. At $500 to $600 a head this represents a significant financial loss, and the Johnsons have yet to collect any royalties from the well. Billions of dollars worth of natural gas is wasted each year, says the World Banks’ Global Gas Flaring Reduction Partnership. Gas that could otherwise be used to heat homes, cook food or fuel local economies is instead going up in smoke – burned or flared at oil fields across the world. That flaring produces some 400 million tons of greenhouse gas emissions each year. Now, preliminary data from World Bank shows that the shale energy boom is fueling a rise in the burning of waste gas. Around the world, gas flaring crept up by 4.5 percent in 2011 – an amount “equivalent to the annual gas use of Denmark” according to a Reuter’s report published yesterday. The World Bank report is due out at the end of the month. The data indicate that this increase is mostly due to the rise in shale oil exploration in North Dakota, an increase that pushed the US into the top ten gas flaring countries. Flaring is used to eliminate gas at exploration sites and to test production of the well. The problem is that flaring gas releases a large number of pollutants into the air, including chemicals used to frack the well. In addition to the methane, flaring adds another five dozen chemicals into the air, including: acetalhyde, acrolein, benzene, ethyl benzene, formaldehyde, hexane, naphthalene, propylene, toluene, and xylenes. Flaring is permitted, but companies could use “greener” technologies that would not only keep these chemicals out of the air but would save money (a savings of $9 for every $1 spent on these technologies according to Deborah Rogers). One tiny detail: these cleaner technologies usually require a gas pipeline to be in place first. A 2009 report on green completions from SMU explains that companies could capture up to 70% capture of formerly released gases with green completions.